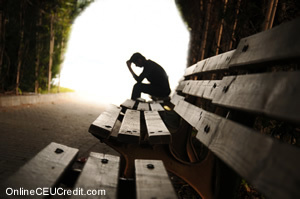 By effectively differentiating among certain characteristics of the suicidal crisis, the clinician will be better able to manage the clinical conundrums so common in the treatment of this patient population. Acute conditions are, by their nature, state (transitory) disorders. The patient's symptoms are the product of an acute process generated by biopsychosocial disturbances. Acute conditions (a) improve, (b) become persistent or chronic (become trait phenomena), or (c) cause the sufferer to succumb. Acute suicidality conforms to the definition of a state disorder-the unfortunate convergence of mental disorder with personal and/or social vulnerability that has inspired lethal intent. The patient will recover, will incorporate suicidality into his or her adaptational style (become chronically suicidal), or will die by his or her own hand (Havens, 1963). Inpatient units are particularly effective in controlling acute suicidality by treating acute symptoms and by providing temporary safety, support, and hope. Inpatient units are not particularly effective in controlling chronic suicidality, especially in nonpsychotic patients. To paraphrase Gutheil (1985), acute suicidality is a defect in the metabolism of despair, whereas chronic suicidality is a defect in the metabolism of responsibility. I know of no short-term inpatient unit that can significantly alter character or ingrained deficits in individual responsibility. A cornerstone of psychiatric theory and practice is the uncensored expression of ideas and affects. From the outset of hospitalization, the suicidal patient must be told that staff are prepared and able to hear the disturbing ideas and feelings that the patient cannot bear alone and that threaten his or her well-being (Sederer & Thorbeck, 1991). At the same time, staff must convey-clearly and firmly- that suicidal behavior cannot be tolerated. Patient safety is always the first priority of the patient milieu. Suicide ideation can be understood as the product of despair, as a communication, or even as a form of self-soothing (Buie & Maltsberger, 1983). In all cases, it serves a purpose. The clinician's aim is not to try to take suicide ideation away from a patient, because this would deprive the patient of a necessary mental operation. Instead, the clinician offers the patient both the opportunity not to be alone in despair and the prospect of altering illness and circumstance so that suicide ideation is no longer necessary for psychic equilibrium. A further distinction that the clinician should understand is that between suicide threats and suicide ideation or intention. Suicidal ideation and intention (acute) are symptomatic of illness, despair, or disequilibrium. Suicidal threats are very different. Threats are interpersonal acts meant, consciously or unconsciously, to manipulate someone. That someone, be it family, friend, or the clinician, often cannot marshal empathy and support for the person making the threats, because he or she feels resentment or aversion, the common by-products of the experience of being manipulated. The clinician cannot be hostage to a patient's threats and simultaneously provide what the patient truly needs. As Main (1957) said, "sincerity by all about what can and cannot be given with good will offers a basis for management (p. 145, emphasis added). Parasuicide refers to behaviors that are equivocally suicidal, such as gestures or self-destructive acts that are not lethal in intent (Kreitman, 1977). Parasuicide is a "non-fatal act in which an individual deliberately causes self-injury or ingests a substance in excess of any prescribed or generally recognized therapeutic doses" (Kreitman, 1977, p. 3). Parasuicide does not have death as its aim, which is what differentiates it from a completed suicide that is not an accident and a serious suicide attempt that is foiled by unexpected discovery and rescue. Parasuicide has been understood as manipulative, depersonalized, or both (Maltzberger & Lovett, 1991). Manipulative parasuicide aims to control others and is generally inspired by rageful panic or narcissistic shame and injury. Revenge may be the primary motive in manipulative parasuicide. Depersonalized parasuicide aims to relieve the patient of an unbearable numbness, alienation, or derealization. Its method is usually self-mutilation through cutting, burning, banging, or biting. Parasuicide may not be an adequate indication for hospitalization. If a pattern of increasing self-destructiveness develops, however, hospital-level care may be needed to avert the progression to a lethal outcome. The treatment in such cases differs from that offered in suicidal situations, because the aims and methods of parasuicide do not merit the same safety considerations and therapeutic interventions that apply to the suicidal patient. How does a suicidal threat differ from an ideation? Record the letter of the correct answer the CEU Answer Booklet.